This painting is a victory banner or diagram. Its inscription says it was consecrated by Jinabhadrasuri, the chief of the Kharataragachha, during the auspicious Diwali festival in 1447 AD (v.s.1504). This makes it one of the earliest dated Jain cloth paintings to survive. The space for the donor's name is left blank. This suggests that the painting was made to be sold rather than as a commission. A cloth painting of this type was known as a ‘Yantra’. It was designed as a visual aid to help the donor to achieve victory in some human endeavour through esoteric rites (‘yantras’). The centre field of the composition is a grid pattern is divided into quadrants by two columns. These columns include both numerals and mantras. The remaining squares contain numbers. The larger squares at the four cardinal points and at the centre contain mystic syllables. The two registers along the top of the painting are divided by a narrow band containing the dedicatory inscription. The focal point is the central parasol, which occupies both tiers. It is one of the 14 jewels that are symbols of a universal monarch. The other 13, including the elephant, cow, horse, general, queen, minister, wheel and conch shell, are represented in the lower register. 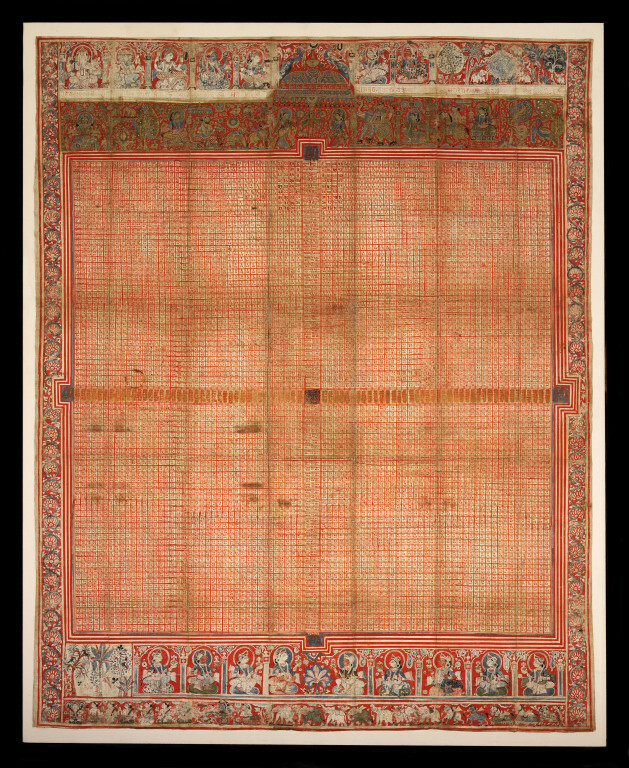 Victory banner (Jayatra yantra) of painted cotton with gouache, ink and gold. The body of the painting consists of a grid pattern divided into quadrants by two columns crossing in the centre. These two columns include both numericals and mantras, while all other tiny squares contain only numbers. At the four cardinal points and at the centre are larger squares with mystic syllables. Two borders of stylised flowers adorn the vertical sides. Along the top of the painting are two registers with figures and symbols divided by a narrow band containing the dedicatory inscription. The focal point is the central parasol, which occupies both tiers. On either side of the post are female flywhisk bearers and, above, an auspicious waterpot flanked by a pair of peacocks. The umbrella is one of the fourteen jewels, symbols of a universal monarch, and the other thirteen- elephant, cow, horse, general, queen, minister, wheel, conch shell, etcetra- are represented in the lower register. In the upper register are several deities including (from left to right) Ganesha, Brahma, Siva, Vishnu, Sarasvati, and two goddesses who cannot be identified. The last panel in this register depicts a stylised pool of water, flanked by two elephants set in a forest of decorative trees. At the bottom of the painting are two registers of uneven size. The upper register begins with a panel of trees followed by nine goddesses holding waterpots. They differ only in their complextions, three being darker than the others. The narrow register below is occupied by the planetary deities, seven elephants and five horses. The significance of many of these iconographic elements remain unknown, but they are rendered with much finesse. Not only are the figures articulately drawn, but the luxuriant garments and delicately lined landscape elements are similar to the most opulent manuscript illuminations of the period. 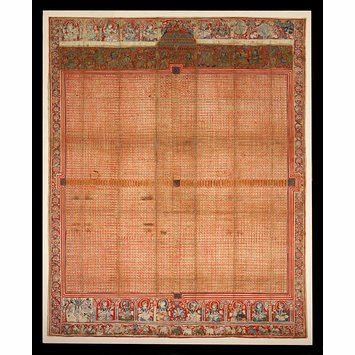 The painting, characterised as a victory banner or victory diagram, was consecrated by Jinabhadrasuri, the chief of the Kharataragachha during the auspicious Diwali festival in 1447 (v.s.1504). Curiously, the space for the donor's name is left blank, which may imply that it was a readymade painting awaiting a donor. Since the painting was designed for rites meant to ensure victory, one would assume that the donor would be involved in a struggle, if not a battle, of some sort. Not only is this one of the earliest dated Jain paintings to survive, but it is also important for its subject matter. It primarily served as a visual aid in esoteric rites (yantra). Barnard, N. and Wheeler, M. 'Jain Manuscript Pages and Paintings Display at the V&A. 14 May 2010 to 31 December 2012', Jaina Studies: Newsletter of the Centre of Jaina Studies, Issue 6, March 2011, pp. 48-50. Shridhar Andhare in Pal, P. ed. The Peaceful Liberators: Jain Art from India. New York and London : Thames and Hudson and Los Angeles : Los Angeles County Museum of Art, 1995. ISBN 050001650x and ISBN 0875871720. pp.225, 226. Guy, J., and Swallow, D., (eds). Arts of India: 1550-1900. London : Victoria and Albert Museum, 1990. ISBN 1851770224. p.30, no.17. and p. 18-19 (detail). Shah, Umakant P. Jaina-Rupa-Mandana (Jaina Iconography). Volume 1. New Delhi, Abhinav Publications, 1987, pp.72-3. Balbir, N. [et al]. Catalogue of the Jain manuscripts of the British Library : including the holdings of the British Museum and the Victoria & Albert Museum. London : British Library and The Institute of Jainology, 2006. 3 volumes, ISBN 0 7123 4711 9. Vol III, Cat. No. 1196, no. pp. 331-2.
p. 98, nos. 8 and 9.
pp. 95 and 98-99 and 102, pl. 4.4 and a, b and c.